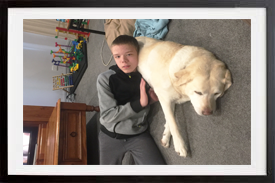 Ashton and Daisy- their Story! Daisy is Ashton’s best friend. The fact that she has four legs and a tail doesn’t bother him at all. Daisy has been Ashton’s best friend, and part of our family for over five years now, and we couldn’t imagine life without her. Ashton doesn’t say much, and finds social interactions very difficult. But if anyone asks him “What’s your dog’s name”, you hear a very confident and proud “Daisy!”. When I pick Ashton up from activities and programs, the carers will often tell me “All we have heard about is Daisy”. Daisy is great at breaking down social barriers and creating opportunities for communication. Because of Daisy, Ashton is calmer going out into the community. If we have to wait, it’s not as big a problem as it used to be. If we have to negotiate large crowds of people, that’s ok too. We can now walk to the bus, go to the shopping centre, restaurants, attend medical appointments etc., with a lot less stress and anxiety. Daisy also alerts us if Ashton wakes during the night and is wandering the house. She alerts us if Ashton is becoming anxious and needs redirection. She can also help provide this redirection. She is a great distraction when we need to give Ashton his eye drops or immunisations for example. Ashton especially likes her “kisses”. They both get very excited when its mealtime. It is Ashton’s responsibility to measure out Daisy’s food, ask her to sit, and then yell out “release!!!”. 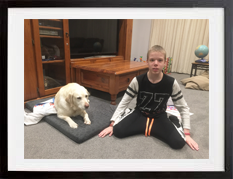 Daisy has assisted teaching Ashton many skills like how to brush teeth, how to be respectful, recognising emotions, measuring dog food, throwing dog treats, bathing/washing, responsibilities, and communication. You are only limited by your imagination. Ashton may not relate to Daisy in the same way as most people relate to their dogs, but he is the first to call her if we are heading out, or to notice if she is out with another family member. The most important thing that Daisy has taught Ashton, is that she is there for him.